Because my husband is a huge fanatic of asparagus, the month of May is always dedicated to searching out places where it was fresh picked. The quantities we generally buy are pretty large so I have to organize myself to cook it in various ways. One night when I came back from work and I found two beautiful bunches of asparagus, one green and one white, on the kitchen table. I thought I would make a savory pie for dinner but then I realized that I was missing an ingredient that is commonly used for this type of preparation: ricotta. After rummaging in the fridge, I realized that I had just a little bit of parmesan cheese and some eggs, so I created this recipe that my family found very tasty and digestible. This preparation may be accompanied by a salad for a light dinner or it can be a as a starter suitable for an “asparagus themed” dinner to offer to friends. Thoroughly clean the asparagus and remove the hard part on the end. Cut into small pieces. Place the asparagus aside in a bowl. Add the onion with the butter in a saute pan. Cook it until it just becomes transparent then add the asparagus, water, and granulated bouillon, salt and pepper. Cook slowly until the asparagus soaks up all the cooking liquid. Turn off the heat. Put the cooked asparagus in a bowl, add the nutmeg (some grated), eggs, flour, breadcrumbs and cheese, season with salt and pepper. Butter 4 aluminum molds and pour a little breadcrumbs turning the aluminum mold to make it adhere well. Pour into each ramekin. Place the aluminum molds in a steaming basket and cook them in this way for about 30 minutes. Meanwhile, blanch the tips of the asparagus in a little salted water for 5 minutes. To serve remove the sformatino from the aluminum mold by turning it upside down onto individual dishes and decorate with the asparagus tips that haave cooked separately. 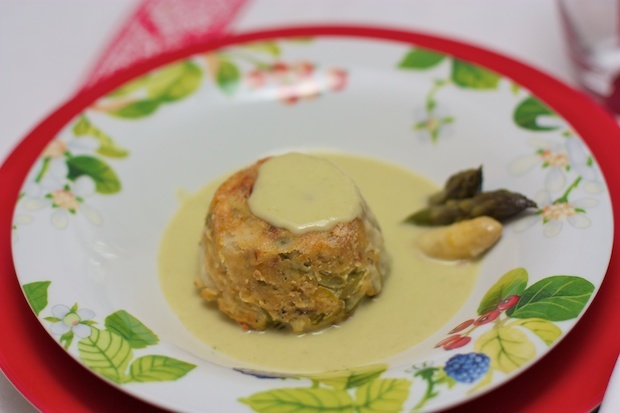 You can also blend some of the asparagus tip with some heated cream (1 small carton) and serve as pictured. Posted in Appetizers, Recipes, Vegetables. RSS 2.0 feed.